Jungle Jim's is a proven and successful casual restaurant concept where Guests can feel just as much at home whether with family, friends or business associates. Why are we so successful? It’s simple. We Make Guests Happy with Great Food and Friendly Service in a Fun-Filled Atmosphere. The Jungle prides itself on service that's a little bit zany, a little bit different, and a whole lot friendlier than most restaurants. This would never be able to be achieved without the dedicated, enthusiastic team found at every Jungle Jim’s restaurant. A warm welcome, friendly smile, great service and delicious food is what keeps our guests coming back time and time again. With an extremely colourful and lively ambiance as the backdrop, our diverse menu with Jungle signature items feed the hunger, thirst and imagination! As Franchisors for Jungle Jim’s, we ensure that all new Franchisees are set up with a recipe for success. FULL DISCLOSURE. We fully comply with all laws requiring advance disclosure of information to prospective Franchisees. All information material to the Franchise relationship will be contained in a written Franchise Agreement. FRANCHISEE SELECTION AND SUPERVISION. We accept only those franchisees that, upon reasonable investigation, appear to possess the requisite skills, education, personal qualities, and financial resources to meet the needs of a successful restaurant operation. We provide training and reasonable supervision over the activities of Franchisees to protect the integrity of the Franchise system. SITE SELECTION AND CONSTRUCTION. We provide full professional assistance in site selection and lease negotiation, with a minimum one-mile exclusive territory. We will also "deliver" your restaurant on a totally turnkey basis. STAFFING & OPENING ASSISTANCE. We work with you to fully staff your restaurant and provide start up training and assistance. PROFITABILITY MONITORING & ONGOING SUPPORT. We provide full operational support after opening your restaurant, including ongoing monitoring of restaurant profitability. ADVERTISING & PROMOTION. We pool Ad Fund contributions to deliver unique & effective campaigns, with an emphasis on "Four Walls Advertising" i.e. in house promotions to reward current Guests. BUYING POWER WITH LOCAL FLEXIBILITY. We ensure that the benefits of Jungle Jim's buying power are enjoyed at the Franchisee level, not at the Franchisor level. CONTINUOUS IMPROVEMENT. We work continuously to improve restaurant operations, always with a view to delivering added benefits to our Guests. As a prospective Franchisee, we encourage you to contact existing Franchisees and seek legal, financial and business advice prior to purchasing a Franchise. 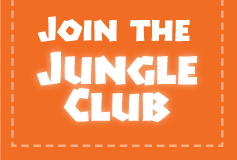 If you think you have what it takes to "Make Guests Happy" with great food and friendly service in a fun-filled atmosphere, download the form below in PDF format, and send it back via Fax: 709-745-5473 or Email: franchiseoffice@junglejims.ca.